Supernova remnant W44 is the focus of this annotated image created by combining data from ESA’s Herschel and XMM-Newton space observatories. W44 is about 10,000 light-years from Earth in the constellation Aquila, the Eagle. Image released Nov. 14, 2012. A pair of European space telescopes have captured the aftershock of a devastating supernova —a snapshot in time of a star's explosive death. The new supernova photo combines views by the European Space Agency's infrared Herschel Space Observatory and X-ray XMM-Newton X-ray space telescope to reveal W44, the remnant of an exploded star about 10,000 light-years from Earth. The supernova remnant W44 is shown by XMM-Newton at high (light blue) and low (dark blue) energy X-ray emission in this ESA image. Pulsar PSR B1853+01 appears as the bright light blue point at the top left. The striping is a result of the image processing. "The supernova remnant is the result of a massive star that reached the end of its life and expelled its outer layers in a dramatic explosion," officials at NASA's Jet Propulsion Laboratory in California, a U.S. partner in the Herschel mission, said in a statement. "All that remains of the stellar behemoth is the spinning core of a neutron star, or pulsar." The pulsar, called PSR B1853+-1, shines in a brilliant light blue hue in the upper right of the new photo. Astronomers suspect the pulsar is about 20,000 years old and nested inside an expanding shell of hot gas that reaches temperatures of several million degrees, ESA officials added. The supernova remnant and pulsar glow an eerie blue in X-ray images from the XMM-Newton observatory. 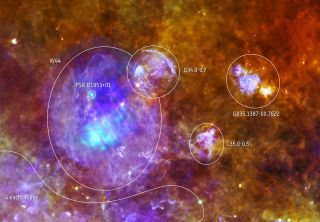 Infrared observations by Herschel also revealed pockets of warm gas around the supernova remnant where new stars are forming. According to ESA, "a number of compact objects scattered across the scene map the cold seeds of future stars that will eventually emerge from their dusty cocoons." The W44 remnant is located inside a dense region of star-forming clouds in the constellation Aquila, the Eagle, and is among the best examples of supernova remnant interacting with its parent cloud, researchers added. The Herschel Space Observatory is the largest and most powerful infrared telescope ever flown in space. It launched in May 2009 to scan the cosmos at infrared wavelengths. ESA's XMM-Newton X-ray Observatory launched in 1999 to probe the universe in the X-ray range of the light spectrum.